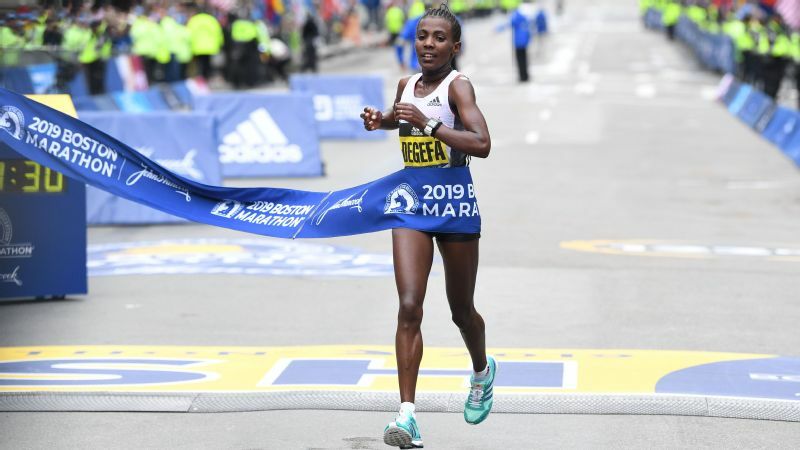 Ethiopia's Worknesh Degefa broke away from defending champion Des Linden and the rest of the women's pack in the Framingham flats and ran alone for the last 20 miles for the win. BOSTON -- The Boston Marathon isn't usually won by one early move and it rarely comes down to a fraction of a second, either. 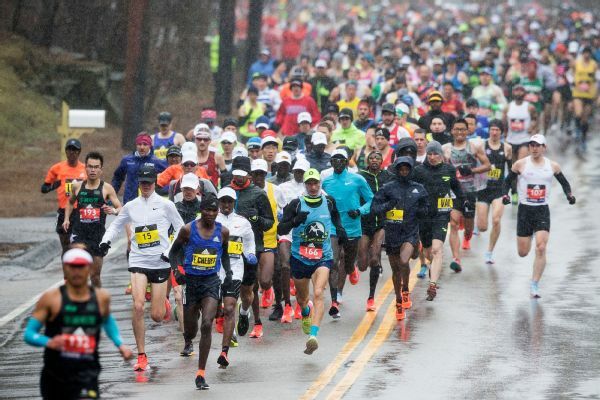 The stormy weather originally forecast for Monday stayed away, but the race still saw lightning strike twice as a pair of East African runners demonstrated two radically different ways to win. Ethiopia's Worknesh Degefa surged away from the women's lead pack at the 5-mile mark in a bold and seemingly perilous solo exploit. Ultimately, improbably, it stuck, as Degefa built up a gap of as much as three minutes on the chase pack and withstood a late charge by Kenya's Edna Kiplagat. The 28-year-old Degefa came into the race with the fastest personal best -- 2:17:41 -- of the elite field, set three months ago on a flat course in Dubai. It was a stat tempting to disregard, especially because Degefa said before the race that she hadn't previewed the undulating road from Hopkinton to Boylston Street and would hit the famous hills sight unseen. She bolted forward into the unknown confident and equipped with "video in my mind'' from having watched previous races, she said, and won in 2:23:31. Moments later, her countryman, two-time Boston champion Lelisa Desisa, was outkicked by two-hundredths of a second, trailing Lawrence Cherono of Kenya (2:07:57) in one of the tightest stretch duels in the event's history. Degefa's pace slowed in the second half and she remained vigilant, turning her head several times to make sure a void still loomed behind her. If she'd been able to see far enough, she might have caught glimpses of some interesting developments. 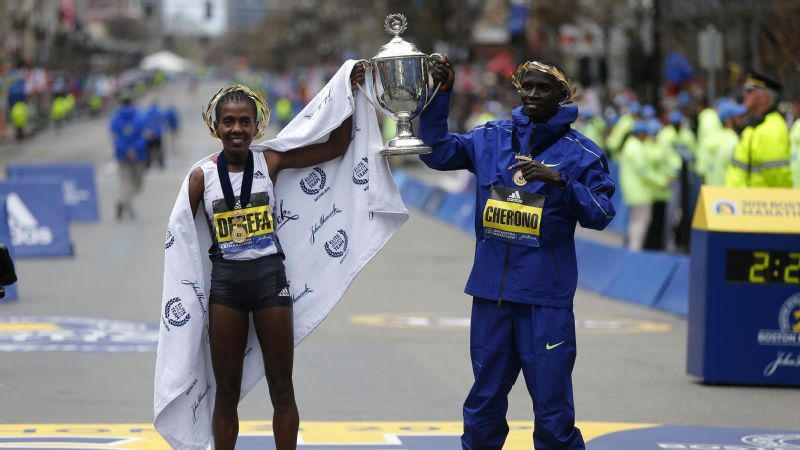 Worknesh Degefa, left, of Ethiopia, winner of the women's division, and Lawrence Cherono, right, of Kenya, winner of the men's division of the 123rd Boston Marathon, hold the trophy at the finish line. Defending champion Desiree Linden labored through the middle of the race before rallying to finish fifth (2:27:00) in a performance that spoke to her trademark consistency and added to a résumé that includes her 2018 win in brutal conditions, second place in 2011, and three more top-five finishes. Race officials waved Linden over to the side of the course reserved for top finishers in the homestretch. She waved and blew kisses to fans and appeared moved by the moment, although she later admitted she was actually fighting nausea. 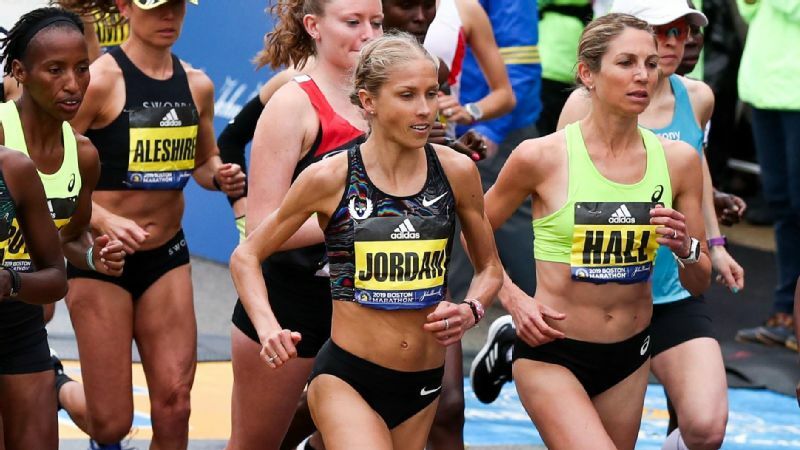 The Michigan-based Linden joked she would have liked to snag a third place -- captured Monday by fellow American Jordan Hasay in a striking comeback run -- to complete her podium set. With her stomach settled, she quaffed a beer after bantering with reporters. But there was deeper emotion beneath the surface. At Mile 18, distanced briefly by the chase pack and knowing a repeat victory was out of the question, Linden fought for emotional traction and purpose, thinking, "What's the point? Why am I doing this? I've got everything." But her mind circled back to Gabriele Grunewald, the world-class middle-distance runner who has waged a prolonged, public battle with cancer. In an encouraging sign for U.S. distance running, Americans Scott Fauble (seventh, 2:09:09) and Jared Ward (eighth, 2:09:25) carved sizeable chunks from their previous marathon bests. Both men took turns at the front as the runners in the lead pack kept testing and teasing each other until the late going. Fauble, in his third go at the distance, found the fleeting moments surreal. Ward's wife Erica, holding their 3-month-old baby girl Magnolia, admitted she wasn't sure what her husband was thinking when she saw him forge ahead. Ward, a Mapleton, Utah resident and a 2016 Olympian, grinned at the memory of the roars he elicited from the Wellesley student faithful lining the course. "It was a blast,'' he said. With their top-10 finishes in a major marathon, Fauble, Ward, Hasay, Linden and Lindsay Flanagan (ninth) of suburban Chicago also achieved the Olympic qualifying standard, taking some pressure off less than a year before the U.S. trials in Atlanta. Traditionally, the top three finishers at trials are automatically named to the U.S. team, but with new international guidelines in place, it's conceivable that will no longer be the case. As runners await clarification from USA Track & Field, "it's one less thing to worry about,'' said Ward's veteran coach Ed Eyestone.